The European Space Agency (ESA) has just released this unusual shot of a spacecraft’s undercarriage. You can look directly into the thruster nozzles an ESA service module for NASA’s Orion spacecraft! 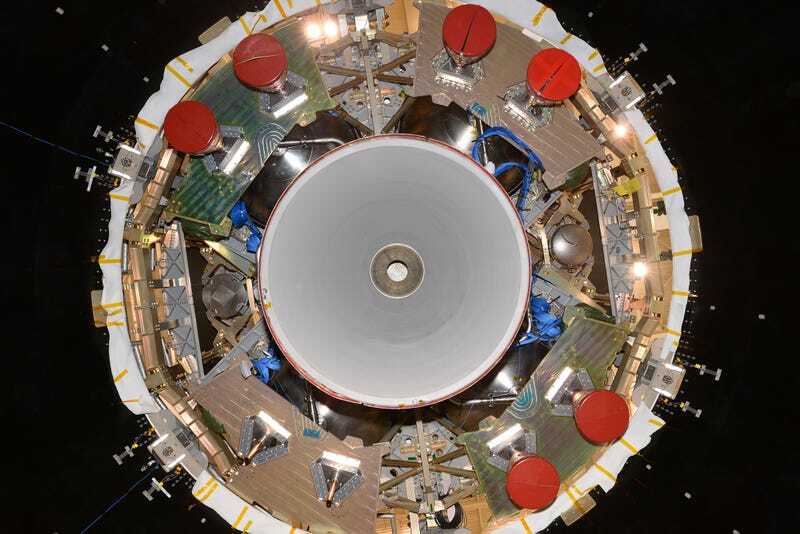 The large gray cone in the middle of the photo is the spacecraft’s main engine, the same model that was used on the Space Shuttle for orbital maneuvers. The six smaller red cones are auxiliary thrusters, which will provide almost 30 kN of thrust, only one-tenth that of a Jumbo Jet engine, but enough to maneuver in space. You don’t try to get vantage point once the spacecraft is fired up, so enjoy it while you can.